For additional information, please follow the link to the Atlas Concorde website. Florida Tile's Earthstone features four earthy color tones with an intricately detailed stone-like surface inspired by the incredible texture of hand cut stone block. For additional information, please follow the link to the Florida Tile website. Johnsonite has expanded their heterogeneous sheet product, Acczent. 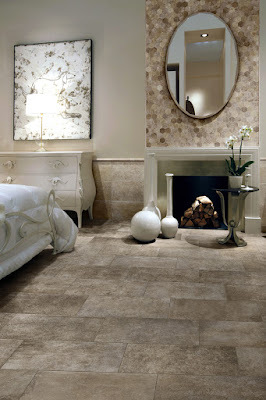 This update creates design continuity between sheet and tile. Acczent previously had 19 items, including 1 steel and 18 wood visuals. Now, there are 25 wood, 6 concrete, 4 Zen, and 4 Tisse looks. Not only does this update offer wood, concrete, and linen textural visuals in both sheet and tile formats, but it is now a matte finish. This change coordinates with the other homogeneous lines. For more information about Acczent and other Johnsonite products, please visit the Johnsonite website here. Johnsonite is available from ISC Surfaces in Kansas, Oklahoma, Western Missouri, and Northwestern Arkansas. For more information about this line or other American Olean products, please click here to visit the American Olean web site. Marazzi's newest introduction, Summerville, is inspired by aged French limestone. This beautiful tile features softly worn surfaces, rustic chiseled edges, enticing colors, and weathered veining. All sizes noted are in inches. For additional information, please follow the link to the Marazzi website. Marazzi is available from ISC Surfaces in Kansas, Missouri, and Central /Southern (south of I-72) Illinois.